On Set. OnTime. When You Need Us! Short on Time? No Time to Talk? Need Something Quick? Click Here and Put us to Work!Call Now! 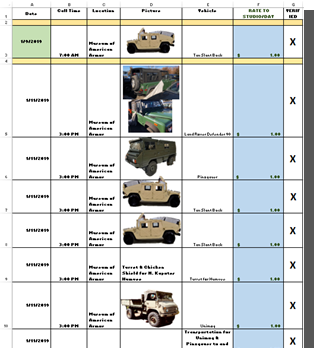 If you don’t see the vehicles you might need in our database, that doesn’t mean it’s not available. We have many private clients that prefer not to have their cars advertised on our site for various reasons. Our speciality is locating the perfect vehicle for your project, on your timeline and delivering it to location at the time you need it. We understand the business, and don’t need to add to an already busy location (even if it means we need to wait in an nearby parking lot). Give us enough notice, we can create you the EXACT car you need. We’re “Car People” we know a thing or two about cars because we’ve been around them a long time. We will research for you. We’ll present options in unsure moments. We’ll find you the right car. We understand you have deadlines and many moving parts to your job. To help make it easier, we send a daily email verifying Date, Times, Location, Pics, Descriptions & Budgets. Everything you need, right at your fingertips. Our state of the art storage facility offers a safe, clean, climate controlled car storage environment. Our convenient location in Hackettstown, NJ allows us to store your vehicle until it is needed on set. If you need work done or visitation with Stunts, AD’s, Directors or Actors, just call ahead. Before delivery to you, each vehicle is checked. On set we always have personnel who are knowledgeable about the units and are there to ensure that everything is ready when you need it.